Located in St. Charles County real estate, homes for sale in St. Charles MO are conveniently located minutes from the airport. St. Charles properties are a mix of newer homes and many historic homes with unique original architecture. St. Charles MO Real Estate and St. Charles MO properties are a perfect addition to the St. Louis Real Estate market. St. Charles real estate is known for the preserved historical features of the area. The Homes for sale in St. Charles MO range in price from about $75,000 to about $900,000. The median home price in 2014 was approximately $285,000. Residents of St. Charles enjoy historic “Main Street” with specialty & boutique stores as well as award winning restaurants. This area is known for its family friendly environment. There are yearly art festivals along with music festivals. The 4th of July brings one of the largest displays in the St. Louis Metro area and Christmas brings weeks of walking tours with Caroler’s, roasted chestnuts and carriage rides. The St. Charles residents are served by the St. Charles School District. See Great Schools for up to date ranking on every school in the area. If you are looking for a home for sale in St. Charles MO or you would be interested in buying a home in St. Charles, please contact St Louis County real estate expert, Sharon Colona and St. Louis Realty for a professional and simple buying or selling process. Call (636) 397-7653 or email at scolona@stlouisrealty.net. This spectacular Schaeffer-built Estate home redefines luxury living! Over 7700 sf of living space enhanced by 10 x2019; ceilings, millwork, tigerwood flooring & high tech integrated systems. Elegant foyer leads to coffered dining room with inlaid marble floor, stunning great room with entertainment center & vaulted study highlighted by brick fireplace. Designer kitchen with 42 x201D; white cabinetry, granite countertops, commercial grade appliances & butler x2019;s pantry with wet bar adjoins breakfast room with wide bay window & sunlit hearth room. Sumptuous master bedroom suite with fireplace & marble bath plus 2 additional bedroom suites complete the main floor living quarters. Lower Level includes family room with stone fireplace, 2nd kitchen, workout room, office, den, 4th bedroom & full bath. Atrium door opens to outdoor living room with fireplace & patio with fountain surrounded by landscaped gardens. Situated on a 1.3-ac lot with 4-car garage & detached 3-car garage with finished upper level. Your dream home awaits! This fabulous custom home is nestled on a private cul de sac offers year round entertaining inside & out. Attention to detail abounds in this 3/4 brick, 5 car masterpiece w/extensive millwork & unique ceilings. Incredible outdoor space w/every upgrade imaginable from the salt water pool & spa to the expansive outdoor kitchen & bar, you will entertain in style. Gather around the free standing fireplace & enjoy the gorgeous view into the common ground at the back of the lot. The chef kitchen boasts Viking refrigerator, 6 burner gas stove, double dishwasher, wine cooler & expansive granite counters. Cuddle up for a movie in the theater room while enjoying cocktails from the gorgeous LL wet bar or enjoy the expansive rec areas & 2 add x2019;l bedrooms. Retire to an amazing master suite w/hydro-therapy tub, heated towel drawer & lush amenities. You will rest secure with the touch pad security system, while enjoying the music system, 3 zone HVAC, ensuite bedrooms & more! Wait until you go behind these doors! The attention to detail is incredible t/o this magnificent estate. From the moment you walk through the doors the detailed wood trim will take your breath away. Gorgeous full brick, sprawling custom 1.5 story home w/ was built by a builder as his own personal home & 2nd owner was also a builder. So you can imagine the custom work such as newly finished walk-out LL with a bar like I x2019;ve never seen, theater room and wine room. The LL has an amazing workshop and enclosed storage for yard equipment, not to mention 3 LL walk-outs. You x2019;ll also love the OS 4 car garage that also has its own staircase to the LL workshop, no mess here. Private, level lot with 2 patios along with a concrete covered deck to entertain your guest. A sound system is located throughout the home along w/ exterior speakers for your enjoyment. Over 7,000 finished sq/ft & an additional 1,000+ sq/ft unfinished w/ plenty of room for storage or adding an additional master suite in LL. Spectacular brick & stone 1.5 Sty from award-winning builder Schaeffer Homes! Impressive 2-sty hardwood foyer leads to private study with 13 x2019; ceiling & custom built-ins, elegant dining room and stunning great room with entertainment center, cast stone fireplace flanked by display cases & dramatic 2-sty bow window. Chef x2019;s kitchen with 42 x201D; cherry cabinetry, Dacor appliances & convenient planning center adjoins light-filled breakfast room with wide bay window & vaulted hearth room highlighted by floor-to-ceiling stone fireplace. Coffered master bedroom suite combines the enjoyment of a tiled fireplace with His & Hers walk-in closets & luxury bath with jetted tub. The 2nd floor extends the living quarters with 3 generous-sized additional bedrooms, 1 with ensuite bath & 2 with Jack n x2019; Jill bath. Lower Level includes recreation room with fireplace, game room & gathering bar plus 5th & 6th bedrooms & full bath. Situated on an extensively landscaped lot with patio & oversized 3-car garage. Executive style home in gated community. This prestigious Fischer & Frichtel home has everything you desire with over 7,000 sq ft of living space. The Chesapeake brick/stone 1.5 story home with 3 car side entry garage includes 6 bedrooms, 4.5 baths, 3 fireplaces, finished LL with walk-out, over 1/2 acre of spacious yard backing to trees. The 2 story hardwood entry foyer opens to a fabulous great room lit by a wall of windows and warmed by a marble surround gas fireplace. Master suite with arched entry and coffered ceiling has luxury bath & whirlpool tub, separate shower & double vanity. Past the wet bar, is the kitchen with island, Silestone counters, cherry raised panel cabinetry,Jenn-Air SS appliances and much more. Hearth room provides black granite surround gas fireplace. The upper level features loft room, bedroom #2 with private bath, and bedrooms #3 and #4 share a Jack-n-Jill bath. The lower level has bedrooms #5 and #6 with full bath, rec room, exercise room, storage and more. Stunning, executive, atrium style ranch in sought after gated community, Spring Mill Estates. Backs to 13 acre lake offering private, tranquil setting. Gleaming hardwood floors, custom mill work and arches, two fireplaces, and a wall of windows create a stunning backdrop to this beautiful, livable home. Entertain with ease in the nicely appointed kitchen with attached hearth room or in the huge, walkout entertainment/game room. Spend your summer evenings overlooking the lake and enjoy two patios or the enormous composite deck. Beautiful brick & stone front in tucked in back of the neighborhd on a court* Hard to find 4 car grg* Office when you walk in with built-in bookcases & fun ceiling fan*Formal diningrm with lots of nice wood work*Plantation shutters across the back of main level*Open heartrm/brkfstrm to the great kitchen w/center island*42 cabinets some w/glass fronts*Trash compactor*Double oven*Warming drawer*Gas cook top with grill in the middle*Granite counters*Ceramic back splash*Large mn floor lndry,cabinet with sink ,cabinets for more storage plus place to fold clothes*Great finished ll with 3 walk outs*Commercial grade flooring*You will have bar envy* 2 fireplaces *1 with a thermostat *A wall of built in book shelves* Deep pour* 2- 200 amp & 1 100 amp service. Screened in porch to relax. Bar outside too next to your bocce court and full masonry frplc * Sidewalks on both sides of home to make it easy for your guest! Tons of lndscpng*Frplc master bdrm * Extra storage in attic above grg. No detail overlooked in this exquisite 1.5 story, built by Fischer & Frichtel! Impressive curb appeal w/ well-manicured landscaping. Amazing floor plan features a main level presidential suite plus 3 BRs upstairs. Hearth rm w/ gas frplc & wood floors opens to the brkfst rm & kit. The island kitchen is a panorama of beauty: granite, Sub Zero fridge/freezer, pot filler, Viking cook-top, walk-in pantry, butler pantry & beverage center! Great rm features recessed lighting, wood floors & crown moulding. Luxurious master suite w/ coffered ceiling, gas frplc. Irresistible master bath w/ heated tile floor, oversized shower, body sprays, granite vanity, soaking tub & an amazingly large walk-in closet with custom organizers. Bonus family/rec rm on second floor. Main floor laundry with granite folding center. Sunroom with built-in jacuzzi. 3 car oversized insulated garage. Half acre lot in a gated community with a praise-worthy back yard. Crowned with Class! STUNNING This 1.5 story 6 bedroom home has it ALL beginning with the stone and brick front. Hardwood floors, 9 ft ceilings throughout, beautiful wall of windows w/ electric shades, built in bookcases, stone fp, the AMAZING Lombardo Kitchen with accent stone behind the gas range, backsplash, HIGH END appliances-sub Zero built in fridge and Wolf drawer style microwave, Granite countertops, butler pantry with beverage cooler, walk in upgraded pantry w/ shelves, dbl oven. The master bedroom has a sitting area with a bay window, the bathroom features his/her vanities, sep tub, upgraded shower w/ 2 heads. Wait until you see the huge CUSTOM CLOSET! Outside you'll find a 22 x 14 covered patio w/ custom drapes and an additional 10 x 14 uncovered area. The yard is fully fenced and also has a sprinkler system. The Basement has 2 additional bedrooms, a full bathroom & another living room. The garage is oversized. There is an alarm system. This amazing home has over 5000 sq footage of living space. Magnificent brick and stone one story home in prestigious Spring Mill Estates! Step through the custom arched double wood and glass entrance doors to enjoy the dramatic open floor plan, floor to ceiling windows, hardwood floors, custom crown molding, a soaring 13 foot turret ceiling in hearth room, full brick gas fireplace, a double set of French doors opening to the beautiful covered porch, granite countertops with island seating, stainless steel appliances and 4 spacious bedrooms and 3.5 baths located on the main floor. Lower level provides additional entertainment or family space with a recreation room, wet bar, a 5th spacious bedroom, full bath and an abundance of egress windows. Manicured landscaping, sprinkler system, 3 car side entry garage, aggregate driveway, a gated community AND the seller is providing an American Home Shield x2013; Shield Plus home protection plan (valued at $635) - Don x2019;t miss your chance to enjoy luxury living at its finest! Stunning 1.5 story home, shows like a display! Over 5500 sq ft of finished living space, plus a saltwater pool & outdoor entertaining area. Gourmet kitchen w/ Granite countertops, staggered Maple cabinets w/ crown, stainless appls, walkin pantry & brft bar. Hearth & great room have gas fireplaces, a dramatic 17 ft wall of windows in great room w/ custom shade covering. Vaulted master suite w/ walkin closet, vaulted luxury bath has dbl sinks, o/s shower, garden tub. Upstairs are 3 more bedrooms, all w/ walkin closets. Fantastic, finished LL w/ tons of windows, 2 w/o doors, exercise room, full bath, family/media room & pool table area. Huge wetbar w/ custom tile work, Granite counter & chiller. Door to covered patio, composite deck, fiberglass pool w/ cool-decking. Beautiful landscaping all around, home backs to heavy woods for privacy. Gleaming hardwood floors, tons of crown molding & wainscoting, new roof 2013, whole house generator, 2 HVAC, alarm & sprinkler systems. Hurry in! Motivated Seller!! Impressive home on almost a 1/2 acre partially wooded lot. Sits on a cul-de-sac w/a spacious covered front porch & 3 interior FP's. Refinished hardwood floors throughout main & upper levels including stairways. 9ft. ceilings on the main & 2nd level. Kitchen w/42 in. staggered cabinets w/crown molding & display cabinet, walk-in pantry, desk, large breakfast bar, & tile back splash. Kitchen is open to the hearth & breakfast rms. Laundry rm w/ship lap wall, folding table, sink & cabinets. Master bedrm has a sitting rm w/window seat, designer walk-in closet & luxury bath. All bedrms have walk-in closets. 2nd level w/walk-in attic space to be finished or used as storage. Zoned heating & cooling. Finished LL w/2nd family rm & stone FP, a large wet bar, 3 additional areas & a 1/2 bath. Screened in back porch w/stamped concrete. 3 car garage w/attached double-door workshop that opens to yard, & 11x6 storage closet. Plus in-ground sprinklers. We could go on & on! BETTER THAN NEW! DON'T WAIT FOR NEW CONSTRUCTION! Gorgeous 3BR 3BTH ranch that SHOWS LIKE A DISPLAY! Nestled On a fabulous lot backing to trees, this home offers stunning curb appeal w/stone & vinyl front, lush landscaping w/irrigation sys & 3 car garage. Professional interior decor w/many special details such as shiplap walls, barn doors, window benches & wood floors throughout the main lvl create a charming & comfortable home setting. Walking in you'll notice dining rm that leads you to the spacious great rm featuring a gas FP. Beautiful kitchen w/custom cabinetry, granite countertops, backsplash, 10'x5' island w/bkft bar, SS appliances & hearth rm w/door to the lighted outdoor patio w/pergola & gas firepit perfect for outdoor enjoyment! The MF master suite provides a walk-in closet & deluxe BTH w/dbl vanity, soaking tub & shower. Add'l BR, den, full bth & laundry/mudroom complete the main. Partially finished LL offers a rec room, 3rd BR & full BTH. List goes on and on! A MUST SEE! Just steps away from the Katy Trail - biking & hiking. .64 Acre lot. Gorgeous, well maintained expanded floor plan - soaring ceilings, exquisite millwork plus so much more. Master suite plus two additional bedrms on the main level PLUS a private BONUS bedroom suite in the upper level. Divided bedroom floor plan offers beautiful wood floors. A desirable WHITE Upscale kitchen with granite counter tops & stainless appliances. This is your Dream House. The VIEW from every window is mature beautiful trees ~ a private setting. Fresh neutral paint & decor, cozy hearth rm off the kitchen. Wall of windows. This wonderful floor plan includes a Jack & Jill bath, coffered ceilings, walk in closets, main level laundry with cubby station and 3 car oversized garage. Work from home in your own 'home office'. Enjoy your favorite movie in the media/theater rm, 5th bedroom, game room, bar -refreshment station in the finished walk out lower level. Beautiful deck & patio. Dual HVAC & Water Heaters. Stunning 4+bdrm/3 bath ATRIUM ranch in popular Austin Ridge! Over 4900 SF on a .83 acre lot backing to 17 acres of private woods! NEW ROOF/SIDING/GUTTERS/DUAL HVAC/WATER HEATER/GARAGE DOORS! Upon entry you are greeted w/ an Open Floor Plan, & Stunning Views. Soaring ceilings & beautiful hardwood floors throughout! Chef's kitchen features stone countertops, custom maple cabinetry, double oven, gas range, walk in pantry & breakfast bar. Enjoy your morning coffee in the adjoining breakfast rm that opens to a large maintenance free deck or sit by the fire in the hearth room! Retreat to your oversized master suite featuring en suite bath w/ double vanity, 2 person jetted tub, shower & large master closet. 2 addtl bdrms round out the main floor. The 2200 SF LL features 10ft deep pour, HUGE Rec Room, Media Room, Wine Cellar, addtl bdrm w/ full bath & private office w/French doors. The LL leads out to a large reinforced patio w/ hot tub & firepit overlooking the private wooded lot! You will love living in this story & a half custom home located on 1.73 wooded acres in the heart of St Charles (Money Mag. listed St. Charles City as#1 place to live in Mo., #32 in the country) Start with great curb appeal & a beautiful lot w/mature trees, inground pool & lake view. The spacious front porch leads to a 2 story entry foyer with an open staircase. MF includes Dining room, large kitchen/breakfast room, MFL, private office, MBR & 2 story GR featuring a floor to ceiling brick fireplace, bookcases & wall of windows for a great view of the pool, patio & wooded backyard and the spectacular sunrises. The large MF Master has 2 W/I closets & bath w/separate tub & shower. Upstairs you will find a guest bedroom w/private bath & W/I closet. There are 3 additional bedrooms & a hall bath upstairs. The oversized side entry garage has an additional work/storage space. Newer stamped driveway & sidewalk. This is a rare opportunity to own a beautiful home on an exceptional lot. Almost one acre home site, 1.5 story, 3,336 sq. ft. Briarcliffe XL plan features four bedrooms, each with it's own bath & walk-in closet. Main floor boasts 10' ceilings, large family kitchen, upgraded cabinets, granite counter tops, large center island, stainless appliances & over-sized walk-in pantry. Breakfast room bay door leads to covered deck, just waiting to help you relax with your favorite beverage or grill dinner. Private main floor master suite has large bath with over-sized vanities & walk-in closet. Second floor offers privacy for family & guests with loft/office/study area surrounded by three bedrooms & baths. Dual HVAC systems keep both floors comfortable year round. Additional features include hardwood floors, specialty ceilings in many rooms, large great room with direct vent fireplace, crown molding, Low E windows with transoms, 50-gallon water heater, 9' foundation pour x2026; so much more. Just seven home site with several remaining. A well-kept secret, but not for long. Elegance abounds in this luxurious Lombardo Homes ranch slated for July completion. 11' & 9' ceilings, rich wood floors & dazzling light fixtures are just the beginning. The soaring great room with a stone fireplace opens to the chef's kitchen which features quartz counters, 42 staggered soft-close cabinets w/roll-out trays, walk-in pantry, apron sink, breakfast bar island & stainless steel appliances, including a double wall oven & gas range with a canopy hood surrounded by a stone arch. A butler's pantry leads you into the dining room. Tucked in the back is the private master suite with a trey ceiling, walk-in closet & luxury bath w/separate vanities, free-standing tub & seated shower. Handy office for those who work from home. 3-car garage with a cubby bench in the family entry to store your gear. Irrigated yard & a deck. Walk-out 9' pour lower level w/roughed-in bath ready for your custom finish. Quaint neighborhood near fabulous amenities in O'Fallon & Cottleville. See it today! 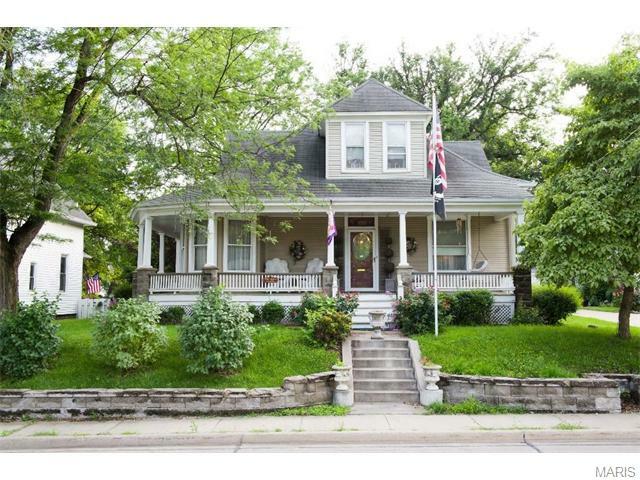 Remarkable location for this beautiful 1895 home zoned for commercial and/or residential use. Listed on National Register of Historic Places. All brick and stone on double lot in St. Charles' Historic Midtown Area. Four bedrooms and three full BR. Beautiful architecture. Hardwood floors. Stained and leaded glass windows and doors. Nine inch crown molding, baseboards and antique chandeliers throughout, and all custom millwork. Imported Italian carved marble fireplace with gas logs. Two antique pier mirrors. Granite countertops. 42 inch cabinets. Sun porch/Four seasons room with 6 1/2 foot windows including transoms throughout overlooking the Missouri River. Full basement with concrete floors, lined with wood and melamine shelving. Expansive Romanstone patios with wiring for a fountain. Wrought iron and privacy fencing. Detached garage. Stamped concrete parking pad. New Price: $574,900. Modern new construction ranch home built in October, 2017. Many upgrades including equipped w/Smart Home Technology & CAT6A to every room. Spacious & open floor plan w/lots of natural light & wheelchair friendly. Hardwood floors. Elegant entry hall w/ coffered ceiling. Relax in the family room that includes stone features, 11' ceilings, archways. Fabulous gourmet kitchen w/huge island & stone accents. Master suite, luxury bathroom & enormous walk-in closet. In-law/guest suite or office w/private bathroom, is separate from the 9' ceiling 4-bedroom wing. 5th bedroom option as nursery. Custom blinds in all bedrooms. Roughed-in sealed elevator shaft, roughed-in bathroom plumbing/bar & egress window for additional bedroom in the lower level. Modern water manifold. 4-car garage. Private & partially fenced level backyard w/retaining wall that is owned & maintained by the HOA. Vogt Brother's Park (10 acres) next to the subdivision w/walkway.